Our dog is blind and deaf, and this bowl is the perfect bowl for him. It doesn’t move across the floor and he can always find his food and water. It’s easy to clean, as the bowls come out of the placemat and can be put in the dishwasher. Great product! My new puppy can't push these dishes around, or pick them up to chew. Perfect. I really love that it stays in place! And I'm glad their were colors to choose from. I just wish this set came in bigger sizes. I have a growing puppy and would like to be able to use it as he gets older. I have a large breed puppy. The bowls are pretty small. Very pleased with the double Ono, solves the issue of sliding dog bowls --under a chair, under the table, etc. Noi more of that! Color pretty, but I don't think my dog cares...Is super easy to clean, holds the right amount of food. Liked it so much, I bought another double Ono for "Guest Dog" and a single for "Guest Cat." 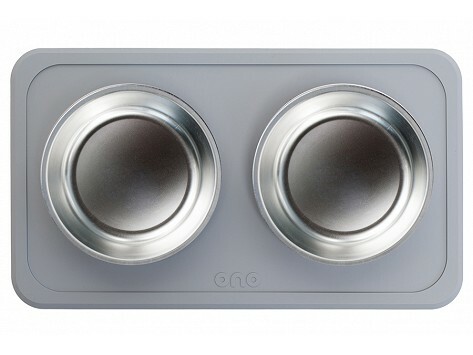 We love our new Ono pet food stainless steel bowls and rubber holder! So much less mess and spilling! And the width of the bowls means no whisker fatigue from bumping up against the sides. 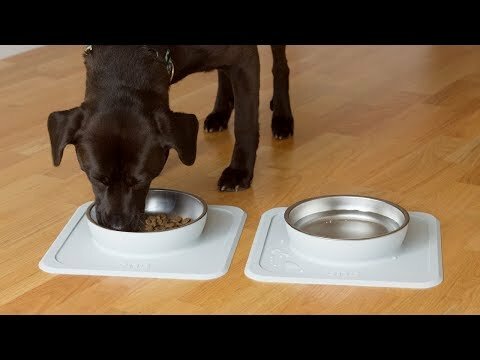 The non-slip, spill-proof silicone pet bowl mats from Ono can tidy up mealtime for your four-legged family members. Their design is molded, which makes sure your pet’s bowl stays put, preventing spills and catching any mess. The food-grade silicone creates a tight seal against flat surfaces, and—like its refillable stainless steel bowl counterpart—it’s super easy to wash. With most bowls, the wet food dries, hardens, and sticks, but with this one, the pet parents in the office really appreciated that it comes right off.